I recently attended a shindig at the new beach-adjacent tasting room of Dave Potter, proprietor of Municipal Winemakers, who crafts tasty and thought-provoking wines in Santa Barbara. One of my favorite bottles of the night was his 2009 MCS — a yet-unreleased wine made up of Mourvedre, Carignan, and Syrah. Anything about that blend strike you as a bit odd? If you’re a seasoned Wino (or have simply spent too much time in the company of Rhône-o-philes like me and Jason), you may notice the conspicuous absence of Grenache, a wine that typically makes up the majority of blends featuring those other three grapes. For this bottling, Dave simply decided to forgo Grenache’s berry-driven buoyancy in favor of the more earthy, heavy-handed flavors typical of the other three — and the results were delicious. However, such a blend would never be allowed in France’s Rhône Valley, the traditional homeland of all of the above-mentioned varietals, because it’s mandated that Grenache be included in blends of this type. Let’s celebrate American-style freedom and ingenuity by drinking Rhône-inspired wines from le monde nouveau, the new world — a.k.a. anywhere outside of Europe. 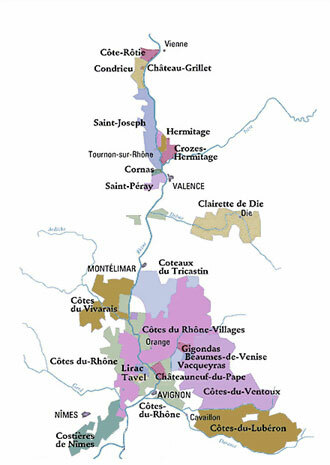 The true Rhône wines, produced in the Rhône Valley of south-eastern France, come from such familiar regions as Côtes-du-Rhône, Gigondas, and Chateauneuf-du-Pape, all located in the Southern Rhône, and Hermitage, Saint-Joseph, and Côte-Rôtie in the North. While the northern regions use only Syrah in producing their red wines, the southern regions blend up to six grapes: Grenache, Syrah, Mourvedre, Cinsaut, Counoise, and Carignan. On the white side of things, Rhône grapes include Roussanne, Marsanne, Viognier, Clairette, and Grenache Blanc. These grapes thus constitute the red “Rhône varietals. (Here’s a map of the Rhône, which you will not be quizzed on). The cool thing about the Rhône grapes is that they’ve been adopted by innovative producers all over the world (including California’s Rhône-happy group of “Rhone Rangers”). It’s therefore possible to find Rhône-style blends — i.e. wines made from two or more of the grape varieties listed above — made in the US, in Australia, and elsewhere. These wines (especially the reds) take the great qualities of the Rhône wines, such as their dense smokiness and their meaty-yet-fruity flavors, and project them onto the characteristics of the local terroir… often to delicious effect. For this meeting, feel free to bring either a blanc or rouge wine (or a rosé, if you like) made from traditional Rhône varietals. There are plenty of great examples of Rhône-style blends in that Rhone Rangers article above, and your local wine vendor should be able to help you find something in your budget. As a special bonus, I’ll be contributing my sole bottle of 2009 Municipal Winemakers MCS! We’ll be meeting at Jason’s new place in West LA. The RSVP system functions like this: if you want in, you click on this link and tell me so (don’t forget your full name, e-mail address, and a cute message conveying to me your intentions). Once you get your confirmation e-mail, head out and find a delicious bottle of Rhône-style wine from the monde nouveau — or simply bring along one of those tasty $10 donations. We’ll see you on Wednesday night at 9:00.